Spare Change for Real Change is an initiative originally set up by Winchester BID to support local homeless charities, Trinity Winchester and the Winchester Churches Nightshelter. Now with the kind support of Winchester City Council, Spare Change for Real Change is undergoing an extra ‘push’ in order to provide support to homeless people in Winchester and prevent street begging in the city. 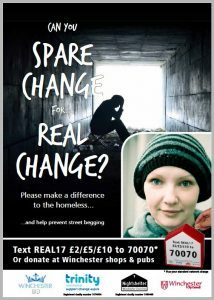 Spare Change for Real Change works by collecting donations from the public and sharing the proceeds between the two aforementioned charities, who ensure that the money is used in the best possible way to work towards rehabilitating homeless people. Did you know that not every person begging on the streets of Winchester is actually homeless? Winchester has recently experienced an influx of professional beggars; these people abuse the kindness of the public by pretending to be homeless and making a living from donations. Of course, this is hugely detrimental to genuinely homeless people in Winchester, who are in desperate need of help, shelter and support. By giving money directly to Spare Change for Real Change, you can be sure that you are truly helping homeless people to get the best possible chance of change, rather than supporting professional beggars. Our aim is to break the cycle of homelessness and end professional begging on the street of Winchester. If you are a business who would like to get involved in Spare Change for Real Change, please contact Jane for more information or to get your collection box or text donation sticker. If your business currently hosts a Spare Change box and it needs emptying, please contact Jane or phone 01962 841000.